It had been a few years since I tried the MacMurray Estates Pinot Noir. I had given the 2013 very high marks – would the 2015 be as good? The answer: a resounding YES. Before my tasting notes, some background. Pinot Noir is a temperamental, thin-skinned grape, which can yield tremendous flavor in the hands of expert winemakers, or lifeless drizzle otherwise. What’s great about a good Pinot is it’s light enough for salmon, but complex enough to hold up to richer meats. If you’re ever in a pinch at a restaurant wondering what to order for your group at a restaurant, you can usually win by picking Pinot Noir; it tends to make everyone happy. 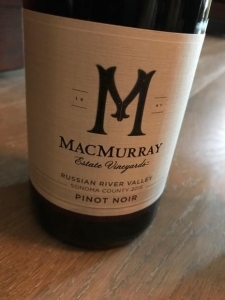 So what about this particular Pinot, the 2015 MacMurray Russian River Pinot Noir? I like a “beefier” Pinot, and this one delivers with aromas of coffee and ripe cherry, and robust flavors of juicy raspberry, balanced with a nice, dry finish. On my five-cork scale based on taste and value, the 2015 MacMurray Russian River Pinot Noir gets 4 corks! Note: you can find Central Coast (CA) Pinot for around $13 a bottle, but those are NOT as good. Find the Russian River Valley bottles. They are a little bit more expensive but are, by far, better wine. Sometimes you need to pay a few dollars more to get a superior product.